On a Windows 10 based computer the following BSOD error appears: "SPECIAL_POOL_DETECTED_MEMORY_CORRUPTION, caused by the file ntoskrnl.exe with error code 0x000000c1. The Bug check error "0x000000c1 – SPECIAL POOL DETECTED MEMORY CORRUPTION" commonly is caused from an installed software or a device driver and is not due to a hardware problem. 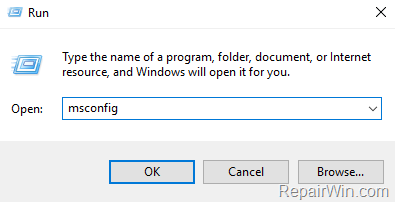 This tutorial contains detailed instructions to resolve the blue screen error 0x000000c1 – SPECIAL POOL DETECTED MEMORY CORRUPTION caused by the file "ntoskrnl.exe". How to FIX STOP 0x000000C1: SPECIAL POOL DETECTED MEMORY CORRUPTION CAUSED BY NTOSKENL.EXE. The first step to resolve the "SPECIAL POOL DETECTED MEMORY CORRUPTION " blue screen problems, is to ensure that your system is virus/malware free. For that task follow the instructions in this guide: How To Scan Your Computer for Viruses and other Malicious Programs. Method 2. Uninstall your Antivirus/Security Software. "The "SPECIAL POOL DETECTED MEMORY CORRUPTION" blue screen problem, may caused after the automatic update of your Antivirus/Security program (especially if you 're using AVAST or AVG). So, proceed and completely uninstall your antivirus program from your system and restart your computer. – If the BSOD problem, doesn't occur after antivirus removal, then proceed to download and re-install the latest version of your security software on your system. Method 3. Start Windows in Clean Boot State. The next method, to resolve the "SPECIAL POOL DETECTED MEMORY CORRUPTION" BSOD problem, is to start Windows in a "clean boot" state, in order to identify which program causes your system to crash. 3. 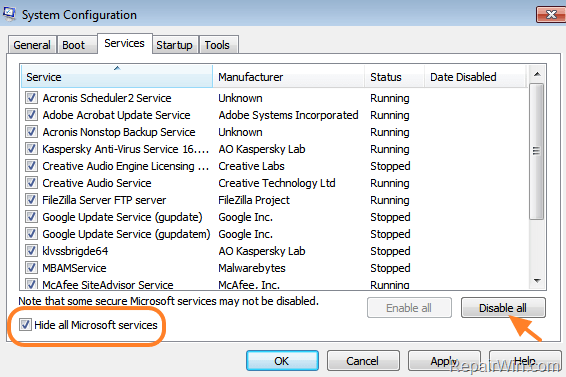 At Services tab, Hide all Microsoft Services checkbox and then press the Disable All button, to prevent all non Microsoft services from starting at Windows startup. 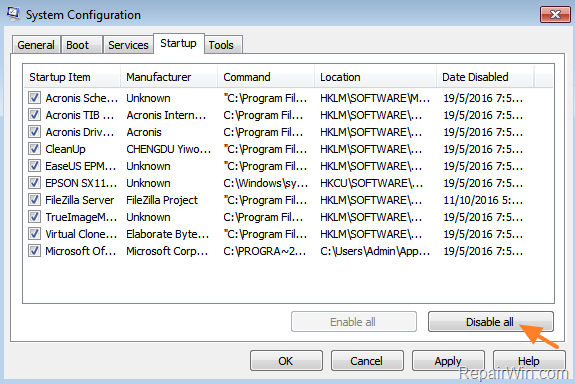 * Note: On Windows 10 or 8, select Open Task Manager in order to disable the startup programs. 5. When done, click OK and Restart your computer. * Note: To exit from Clean Boot state, launch the System Configuration utility and at the General Tab choose Normal startup. Method 4. Check Memory (RAM) and Hard Disk (HDD) for problems. Method 5. Update Device Drivers. 4. Wi-Fi adapter (if exists). « FIX: Application not found in Mail – Control Panel item. (Solved)	» How to Update Chrome Components & Google Chrome Manually.